Penicuik Athletic: Bald, Gallagher, Kennedy, Meikle, Trialist, Milne, R. Harvey, Barr, J. Harvey, Walker and Montgomery. Subs: Trialist, Miller, Steel, Trialist and Moonie. Fauldhouse United: Stewart, Wilson, Wardlaw, Smith, Gallagher, Meechan, Black, Baird, Felvus, Martin and Connelly. Subs: Cooper, Stewart, Dalrymple, Smith and Brown. 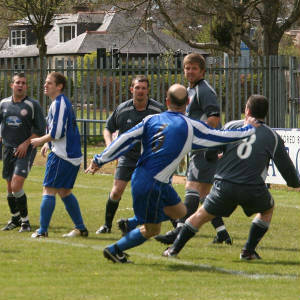 In an afternoon of contrasting emotions Penicuik Athletic faced a Fauldhouse team who had to win the game and hope that other results fell their way to retain their Premier League status. For their part, Penicuik’s terrific win last Saturday at St. Andrews had lifted Penicuik’s relegation worries and confirmed their Premier League place for next season. Despite heavy rain showers the playing surface was still quite fiery and uneven making close control difficult for the players. Fauldhouse kicked off but it was obvious that nerves were going to play a part and the first couple of chances fell to Penicuik before Fauldhouse started to settle. Kennedy was injured in a challenge on Black but was able to continue. 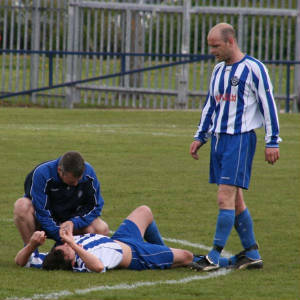 A Wardlaw free kick was headed out of the penalty box by Milne before Walker went down injured in a clash with Wardlaw. Meikle headed clear from a Wilson free kick and Penicuik were settling down to a passing game while Fauldhouse were not slow to clear their lines. Meechan rounded Kennedy but Barr was penalised for his challenge. Centre half Gallagher headed Connelly’s free kick over the crossbar. 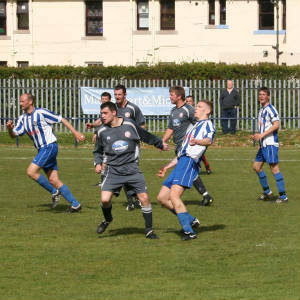 It was Penicuik’s trialist defenders turn to head clear the next free kick. Felvus then headed a Meechan cross over the bar as Fauldhouse applied some pressure. Miller replaced the injured Walker in twenty seven minutes. Meechan shot past before Fauldhouse came their closest to scoring. Another free kick was missed by Bald but Kennedy cleared Felvus’s header off the line straight back to him but his shot was held by Bald. In the thirty seventh minute Meikle and the trialist defender combined to clear another free kick and a sweeping Penicuik move upfield ended with a weak cross from Ross Harvey. With six minutes to go to the break Meechan fired yet another free kick over the cross bar. Milne was becoming frustrated with some of the free kick awards and became entangled with Gallagher. Both were issued stern lectures before the free kick was awarded to Fauldhouse. 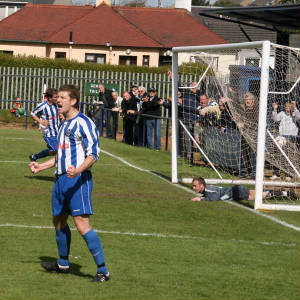 Penicuik finished the half on the front foot when a move involving Kennedy and Milne saw Johnny Harvey narrowly fail to connect with a chip from brother Ross. A sweeping upfield move was spoiled when Ross Harvey over ran the ball on the right wing. The second half started in familiar fashion with Meikle heading another free kick clear before Ross Harvey and Kennedy were replaced by a trialist and Steel. Meikle’s header back to Bald was adjudged to have gone out for a corner kick. Bald missed Connelly’s inswinger but the danger was cleared. Fauldhouse were committing extra men forward and were liable to be caught on the break. A lovely move involving Harvey, Milne and Penicuik’s second trialist finished with Harvey’s mistimed left foot shot looping over the bar. A long pass by Meikle found Montgomery running clear on the left wing and the Fauldhouse defence were happy to concede a corner. Stewart easily saved Miller’s header from Gallagher’s corner. In the sixtieth minute Miller burst clear but the ball bobbled in front of him allowing Stewart to save at his feet. A minute later, Stewart saved Miller’s shot but Harvey hammered the rebound wide of the left hand post. Another long ball out of defence found Harvey and Smith conceded a corner. Gallagher’s kick was deflected to Meikle who sent a delightful chip into Barr who shot high over the crossbar from the edge of the penalty area. Fauldhouse were clearly rattled as Montgomery well backed by Steel and Milne continued to find acres of space up the left wing. A bad foul on Miller saw Meikle booked for remonstrating with the referee but Montgomery’s low free kick did not get past the first defender. Steel’s delivery let him down spoiling another promising move before Fauldhouse hit back. Felvus tried his luck but a diving Bald punched clear allowing Penicuik to break quickly up the park. 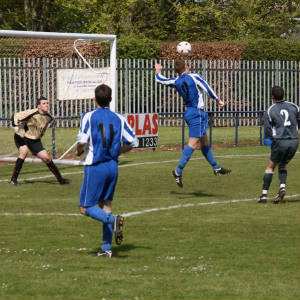 Harvey set up Penicuik’s trialist but there were no takers when the ball ran along the face of goal. With the game hanging on a knife edge Penicuik conceded another couple of dangerous free kicks. From the second, on the edge of the penalty area, Bald produced a quite stunning save at his top left hand corner from Felvus’s well struck effort round the wall. At that point it looked as if it was not going to be Fauldhouse’s day. With six minutes remaining Penicuik’s Gallagher was booked when he confronted the referee’s assistant for not raising his flag. The throw eventually went to Fauldhouse and Felvus’s long throw was deflected narrowly past for a corner. Fauldhouse’s Gallagher headed the kick over the crossbar. Miller was again through one on one with Stewart but again the Fauldhouse goal keeper saved. Harvey showed good control to gather the ball on the right but his parting effort sailed out of the ground. With two minutes of normal time remaining HARVEY was sent clear and rounded Stewart to net the only goal of the game. The referee only added on a couple of minutes and it was obvious that there was not enough time for Fauldhouse to get the two goals they needed. The final whistle saw a dejected Fauldhouse troop off the park headed for next season’s South division. Penicuik can be encouraged by finishing the season on a high with another three points after another fighting performance brought them their third league win in a row. Result: Penicuik Athletic 1 v 0 Fauldhouse United.